A couple of weeks ago, Delicious. magazine announced on Twitter that they were having a cake competition. The most gorgeous, mouth-watering picture would win and be featured on the cover of a Delicious. issue. With only a few days to complete the challenge, and this in the middle of finals craze at university, some might say that I was a bit nuts for attempting it. But hey, I do love nuts. 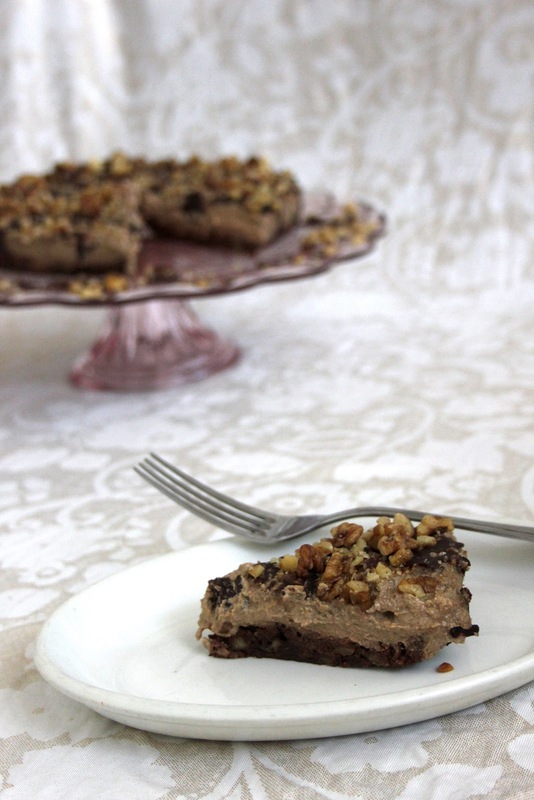 Walnut coffee cake was the first idea that popped into my mind. 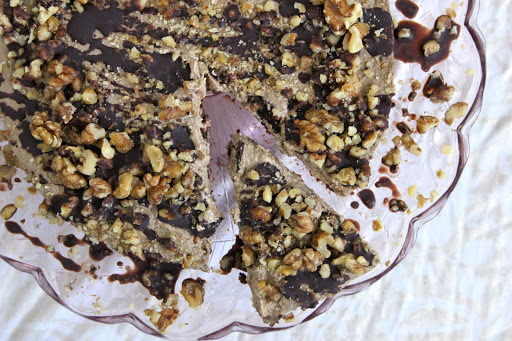 I’ve seen them so many times in various cake and coffee shops and yet I’d never made a vegan version before–or even tasted one! 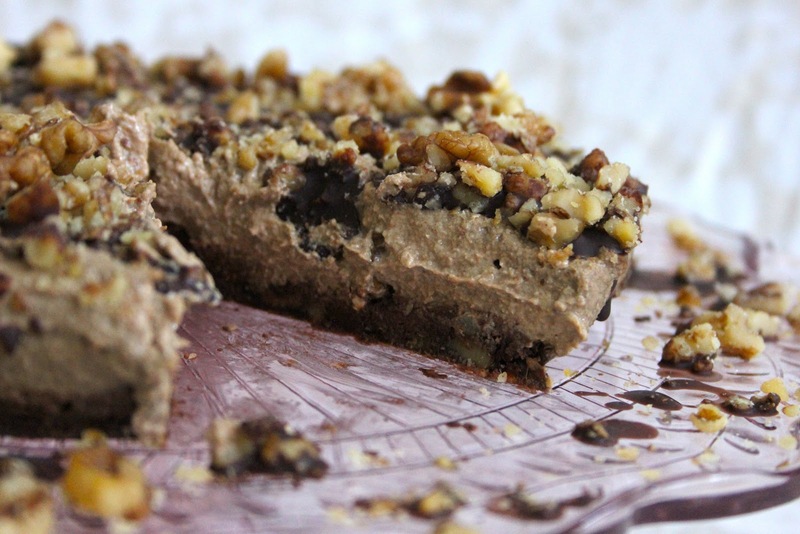 In fact I don’t think I’d ever taste walnut coffee cake at all — so what qualifies me to make a raw, vegan version worthy of the cover of a renowned national magazine, I hear the masses with their pitchforks cry? It’s simple. Passion for good food, for one; and also, you guys know I can bake. So there. In all seriousness, though, I firmly believe that just because you haven’t had a taste of a particular recipe doesn’t mean you can’t make it with your own spin on it. 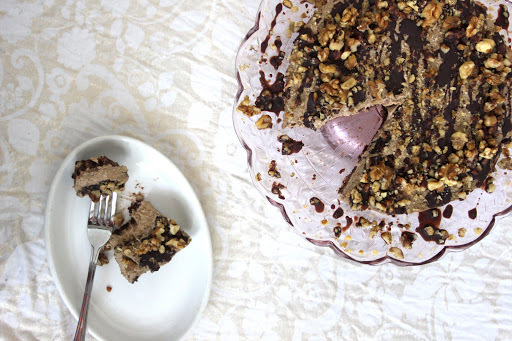 I didn’t want to just recreate any old walnut coffee cake for this competition: I wanted it to be an exciting, tantalising new version. Something the judges had (hopefully) never tasted before. 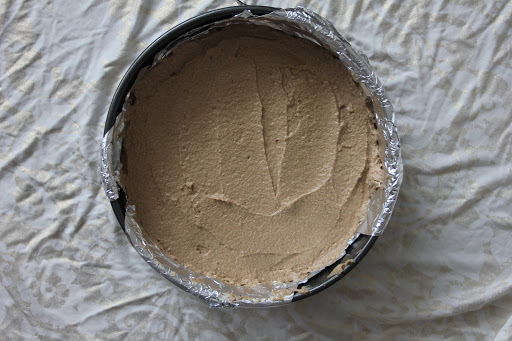 Note: raw cakes are beyond easy to make, but unless you organise yourself, it may take a long time to make. 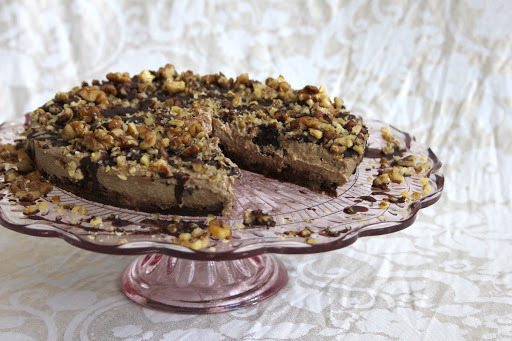 Remember that the art of raw baking/cake-making relies heavily on soaking nuts and dates and leaving the cake in the fridge for several hours to firm up. So measure out all your ingredients in advance, soak what needs to be soaked, freeze what needs to be frozen at least a day in advance, and you will save yourself heaps of time. And another note: if you don’t like the taste of banana in your cake, that’s fine. 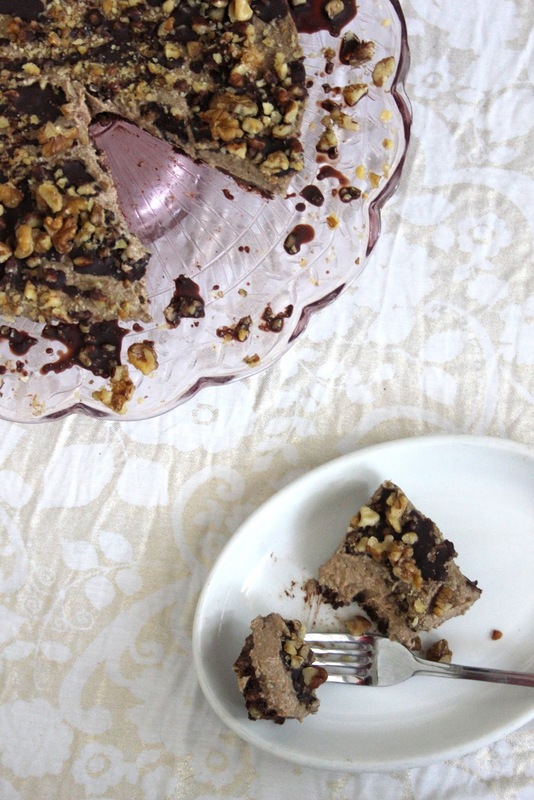 Just double the amount of walnuts in the cake and maybe add an extra splash of water. It will add more fats and calories, but that’s up to you. Final note: I know espresso isn’t raw. It’s the only non-raw ingredient of this recipe. 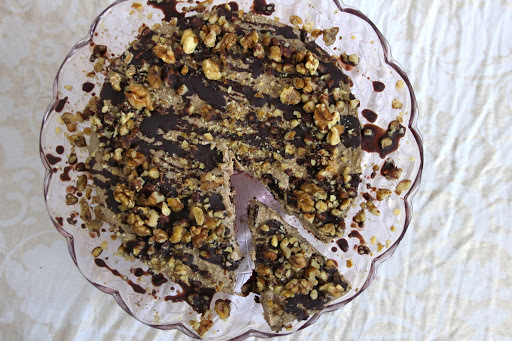 If you know how to incorporate coffee flavour into this cake the raw way, do let me know in the comments below! 1. The brownie base. Soak walnuts, hazelnuts and chopped dates in water for 20 minutes to soften. Drain them and pulse in a food processor until they begin to form a rough batter. Add a splash of water to help the processor. Add the cacao powder and flaxseed, transfer to a bowl and knead for a few minutes with your hands. The batter should be quite tough but still pliable, and hold well together. Press into a lined 8″ springform tin. Leave in the fridge to firm up. 2. The cake. Again, soak the nuts and chopped dates for 20 minutes, then drain. Blend at high speed in the food processor or blender, adding the espresso, vanilla extract and water as you go. When the mixture is smoother, add the frozen bananas and keep blending until perfectly smooth and creamy. 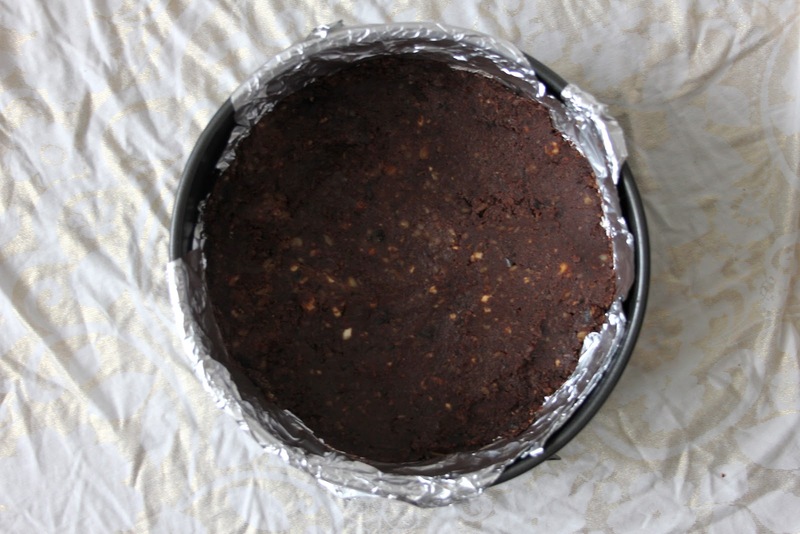 Pour over the brownie base in the springform tin and store in the fridge for at least 3 hours. 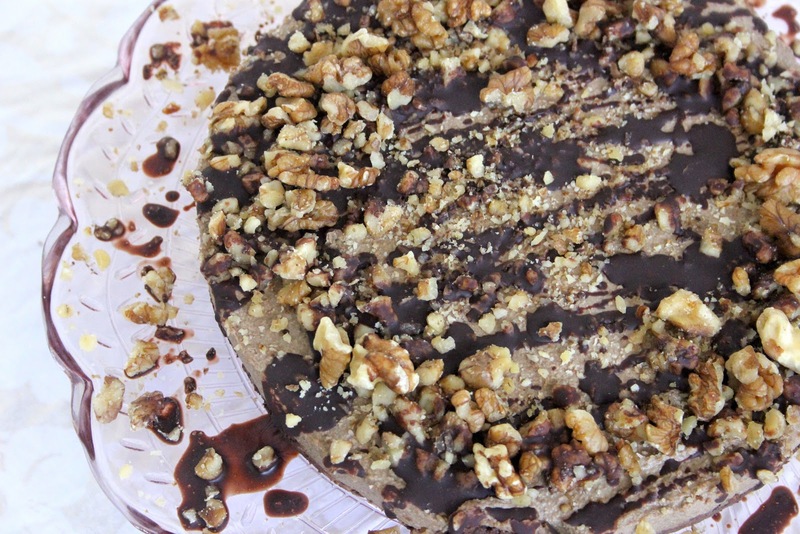 Raw coffee walnut cream for the cake. 3. The toppings. Bring the kettle to the boil. Pour some boiling water into a pot over which you’ll place a bowl. Roughly chop the cacao butter, place it in the bowl and let it melt. This will take about ten minutes. Vigorously whisk in the cacao powder, stevia and espresso, then set aside to cool for five to ten minutes. Carefully take the cake out of the spring form pan. 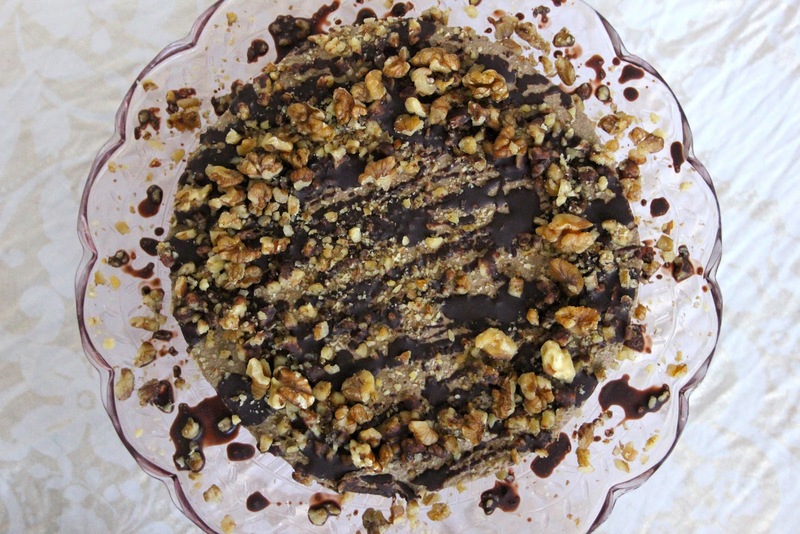 Drizzle the cacao sauce over the cake in a criss-cross pattern, sprinkle over the chopped walnuts, and refrigerate for another 30 minutes or so. I hope you enjoyed this recipe! I’d love to hear from you — what’s your favourite raw recipe? And have you ever entered a cake competition, or won one? This is my first time entering one, so fingers crossed it all goes well! This looks great!!!! 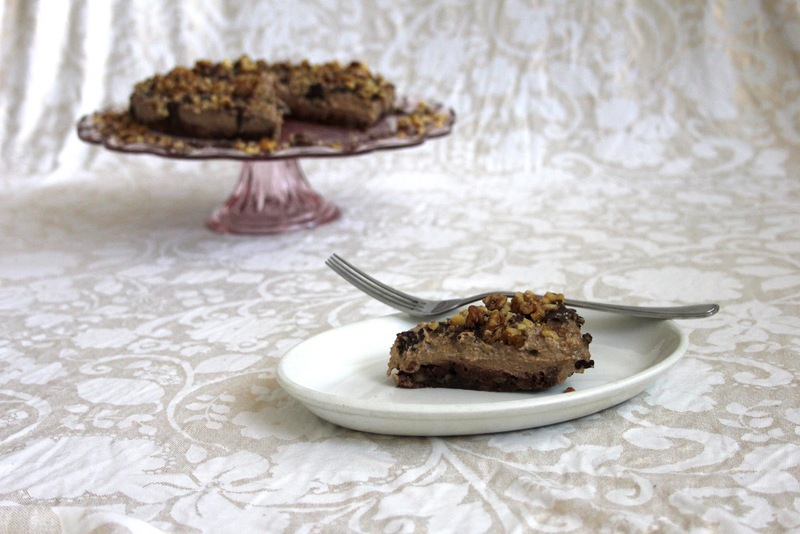 I was a little apprehensive at first, as I don't like coffee cake… But then I saw the brownie part to this recipe and my feelings changed completely!!! Looks really nice, I hope you win!!! When will you find out? I'm also guessing you only had to submit photographs to this competition? This is seriously amazing looking! I am going to have to try this, or something with a similar theme because it just look so good! Thanks for sharing!! Just GORGEOUS. Love your blog! Good luck! You deserve to win! 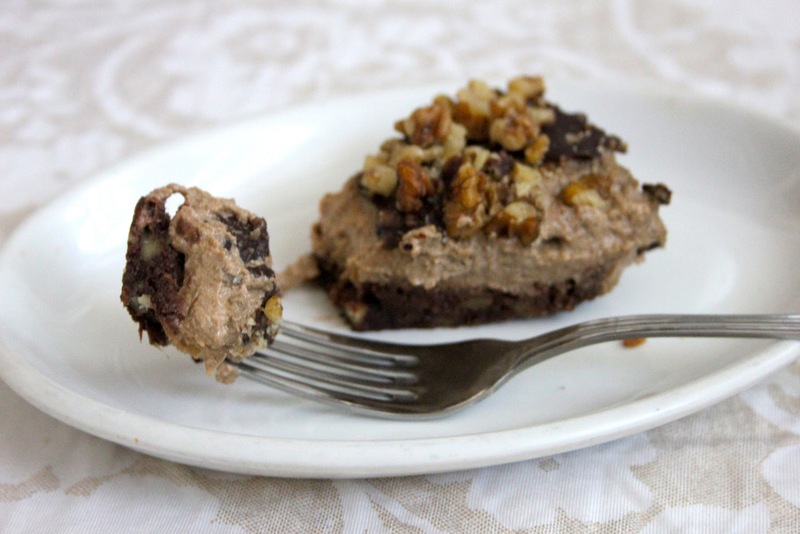 This looks so yummy and the brownie base is such a great twist on your average coffee cake! Looks very tempting (especially since my oven isn't working and I'm seriously craving a dessert) but where do you get cacao butter? I've never seem it at my grocery store anyway. Could I sub coconut oil? I don't know yet, but I do hope I'll win, or at least get shortlisted. It was so much fun to try and enter, I'll go for other competitions in the future if I find any! I had to submit a photograph but also the recipe. Thank you! Yours is ADORABLE, I've just subscribed! Aw bless, I hope I win! You can easily get cacao butter at most health food stores; regular supermarkets won't sell it, it's too much of a special product. It can cost a pretty penny, but if you buy in bulk, it really does last a long while. You could sub coconut oil if you like, in fact you can find raw coconut oil in health food stores and even some supermarkets, especially if they sell organic and fair trade products. Good luck, I hope you like this cake! Haha, sorry, I'd have to hop the Pond! It's so easy to make though, give it a whirl! 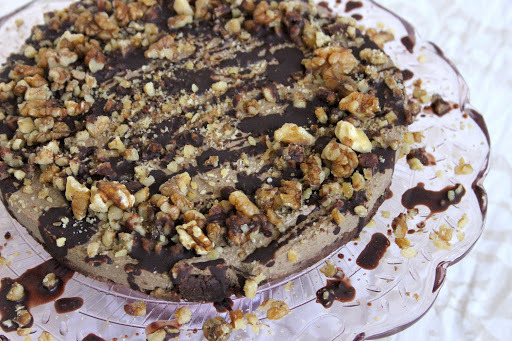 I wanted to thank you VERY MUCH for your lovely Raw Walnut Cake. We run a cooking classes for kids over here, and some of them are raw eaters. After I had seen your cake, I felt in love with it. Tried it with my students and it worked perfectly ! It was a masterpiece !!! I’ll be happy to try other desserts from your books. Thank you for your approach. All the best to you and have a lot of new followers !!! Thanks for the recipe, it looks amazing! Could I just ask if the cake part has dates in it and if so, how much? The ingredients for the cake section don’t mention dates, but the method does, so I’m a little confused and i want to make it perfect:-) thanks!